Surely the hallmark of a truly great style is that it can be adapted to whatever is required of it. 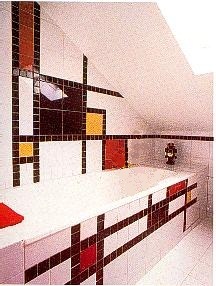 This tiled bathroom looks really stylish, using a Mondrian style painting recreated with tiles. The angled roof seems to emphasis the straight lines of the tiles. Taking photos in a small room, such as a bathroom, is very difficult to show properly, ask any estate agent! The design possibilities are endless with this approach, and relatively cheap & straight forward to achieve. While not to everyone's taste, it does make for a vibrant bathroom design. 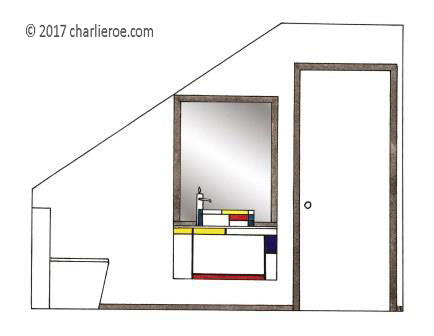 We could design and/or install a bathroom like this for you in any size or shape of room. This room was a fairly typical small family en-suite bathroom. 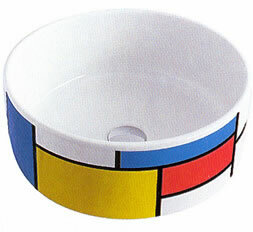 The De Stijl look is really about square shapes & straight lines, so try to keep round shaped to a minimum. We included the round basin here because it matches the style, but a white rectangular sit-on sink would probably be even more appropriate. Bath, basin & shower fittings all come in square options, so go for them. The 2 elevations shown above show the bath wall design, as shown in the main photo. You can see how striking the crisp design is. This is the real Wow factor in a room. But such a large design can visually dominate a room, so it is important to counteract this. This was done by having the walls all white, & with a large dormer window to let lots of light in. Also, this wall is the focal point of the room, so the other pieces in the room were treated with a lighter touch, to complement rather than compete with the eye. 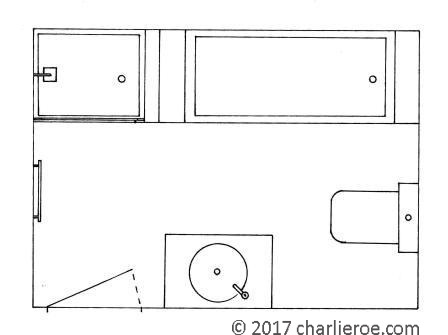 Also, because the lower 1/3 of the design is on the front of the bath panel, in reality you don't see the whole design together as shown here. The design above right shows a couple of niches included in the shower, useful for storing shampoo, etc. The niches have been designed to follow the main wall tiling. Above are shown the other wall elevation designs. Both are the same except the one on the right has a black frame around the mirror to make this visually stronger (basically just to show you an alternative way of treating this). 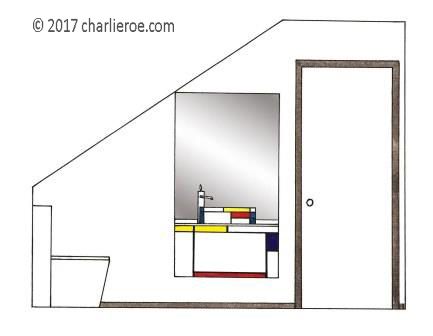 It is shown with a wall mounted vanity unit; as well as looking modern & easy to clean under, it has an obvious de Stijl look about it. 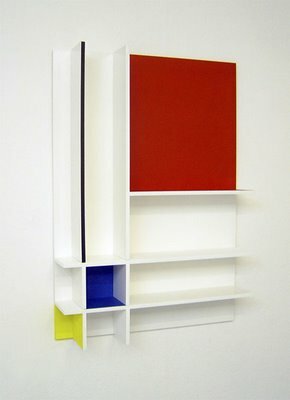 The vanity unit is white with a Mondrian style design on it. 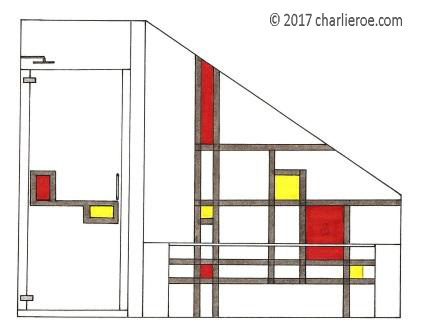 This design has been understated; you can go too far with these patterns everywhere (some De Stijl interiors had patterns continuing across ceilings as well. The door frame could have been left white for a lighter effect. The wlal mirror was set flush with the tiles, to create a clean minimalist look. 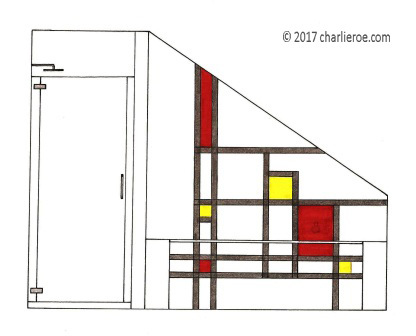 We intend to add a few more Mondrian De Stijl vanity unit designs here soon. Above left; a bathroom sink, as part of the same design style. Shows how far you can go with this design theme. Dia. 39cm x ht 15cm. Please enquire for price and availability. 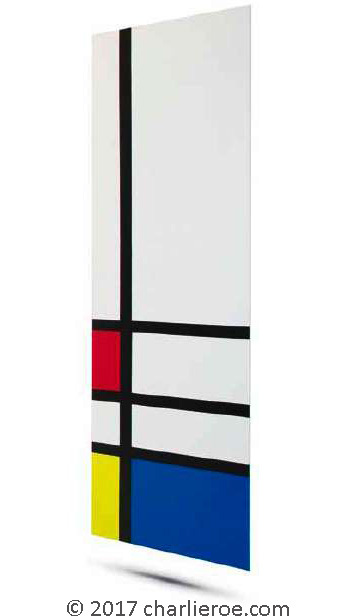 Above right; a flat panel bathroom radiator with Mondrian design! This really works on the same principle as a painting, as in adding a splash of colour to a room. Size 180 x 50 cm (or 100x100 cm). Made to order. Above left; instead of using a plain wall mirror, you use something more elaborate like this wall unit. As well as being a piece of wall art it is practical & store bathroom products. 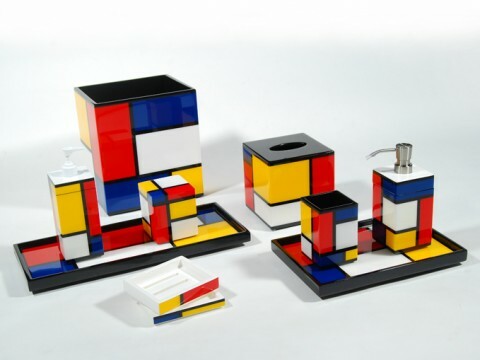 Above right are some Mondrian style bath set accessories, which you can find on the internet. Copyright The Design Service 2014. Our designs are being registered as they are added to the website. Everything on this website has been copyright protected now. The images may not be reproduced without our written permission. All rights reserved.